Is the Canon Speedlite 270EX II the right choice for you? It does give you a nice compromise in power and size. Here is what I mean by that. It's larger and more versatile than the wimpy, built-in camera flashes. It's smaller and a whole lot cheaper than the full-sized, detachable Speedlite flashes like the Canon Speedlite 580EX II or the Speedlite 600EX-RT. It is very light and can fit in the palm of your hand. It is one of those can't-live-without-it Canon camera accessories for me personally.The short video on the Speedlite 270EX II shows what comes in the box and how small it is compared to the Canon Speedlite 580EX. The 270EX II has a guide number of 72 (in feet) at its normal setting and a has a guide number of 89 at it's telephoto setting. That means at the normal setting if your camera lens is set at f-2, the flash would be good up to 36 feet. Guide number: 72 = f/2 x 36 ft. 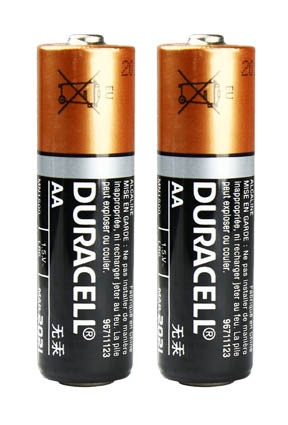 This speedlite takes two AA-size alkaline batteries as its power source. It is only 2.6 x 2.6 x 3.0 in. It weighs only 5.5 oz. It does not have a test button which bothers some reviewers of the Canon Speedlite 270ex II, but for me it's not a big deal. It's just as easy to take a test shot by using your camera. This way you can also look at your camera's LCD screen to better analyze your lighting results. My Canon 5D Mark III has a Multi-Function button which acts as a test button. Critics of the 270EX II point out that it has no swivel feature. If this is a feature you are going to want, then don't buy it of course. Look at the Canon Speedlite 430EX II instead. I've use both of them, depending on the shooting situation I'm in. The 270EX II is a real good choice if you just want to use some fill flash to light up your subjects faces a bit, particularly with outdoor photography, back-lighting and shadows. For me personally, I just love the size. I occasionally use it on top of my Canon 5D Mark III which has no built-in flash capabilities. More typically I like it on the Canon "G" series cameras like the G1X, the G115 and the G11 pictured below. 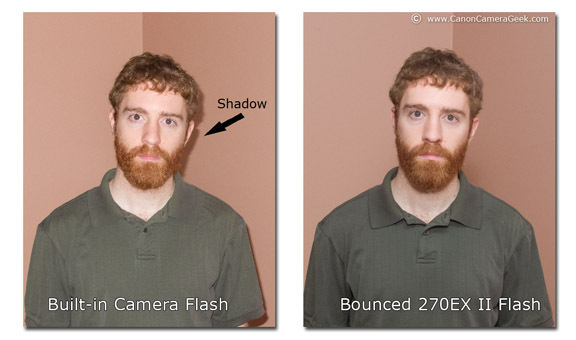 The bounce feature of the Canon Speedlite 270EX II is especially useful for photographing people. I've never been a fan of direct flash-on-camera photographs of people because I am a portrait photographer by trade. I don't like the harsh look of on-camera flash. Not only do you get less flattering portrait lighting, but you also can also get distracting harsh shadows on your background as well. 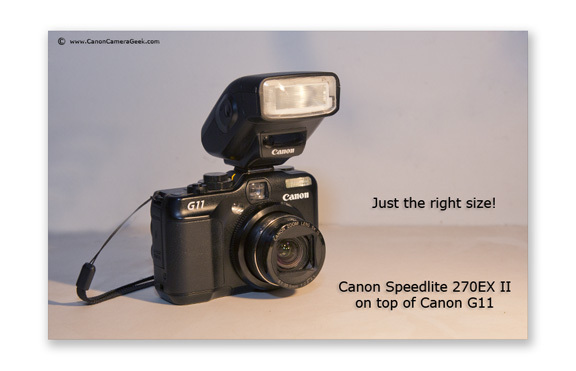 I used my Canon Speedlite 270EX II on top of my Canon G11 in the comparison photo above. Not only do we eliminate the shadow on the wall, we also have a less contrasty, softer, more pleasing portrait lighting in the photo on the right. Heck, even the shirt looks a whole lot better! Being a camera geek, I also did some Macro Photography with my Speedlite 270EX II. I chose the inside of a red pepper as the subject. I was pleased with the results using the simplest lighting I could and got some pretty cool photos. I also decided to challenge myself and create a few Canon Speedlite Portraits with Molly the Mannequin in my dark basement using the 270EX II as the only light source. Another feature of the Speedlite 270EX II is Auto Power Off after 90 seconds of idle time. It also has an AF-Assist Beam. In dark conditions the 270EX II may pre-fire repeatedly to help your camera focus. The Modeling Flash is a feature that allows you fire the flash to view its lighting effect on your subject. This is triggered by your camera's depth of field preview button. If you are photography geek like me you like to try to and use all of the features of your new photography toys. The 270EX II can be used to remotely trigger your Canon camera. 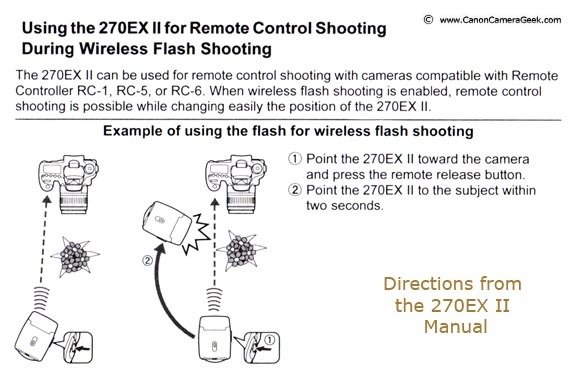 I included a copy of the directions from the 270EX manual below. I am not sure how important this is to you or what the practical uses might be, but sometimes its just a lot of fun to play around. The original Canon Speedlite offering in this size was the 220EX. 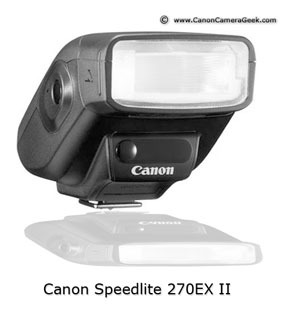 The 270EX replaced the 220EX and the now the Canon 270EX II is the most recent version of compact speedlite Canon camera offers. When I shoot portraits with one of my Canon cameras, I prefer bounced or diffused lighting. 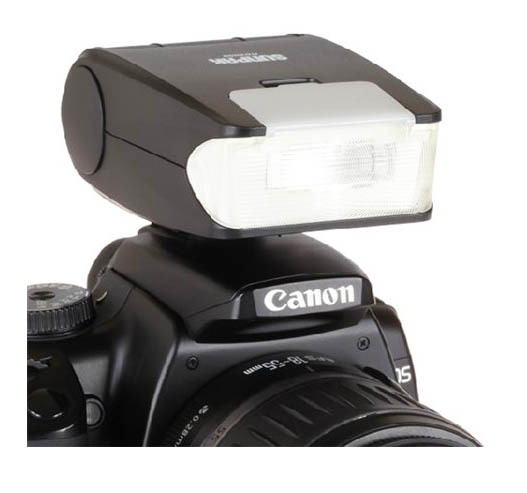 One of the most popular Canon camera accessories is a diffuser for Canon 270EX II made by Stofen. There are also cheaper, economy-priced diffusers available for Canon Speedlites, but they are of suspect quality. Remember the adage: you get what you pay for. The Canon Speedlite 270EX II is certainly not a powerhouse and is not suitable for long-distance flash or photographing large groups of people. With the most recent development in improved high-ISO performance, especially with the larger sensors in premium compact and SLR cameras, you can raise your camera's ISO setting and get a lot of practical use with such a small speedlite. To see a real short clip on the size of the 270EX II compared to the Canon Speedlite 580EX II, watch this short Speedlite 270EX II Video. What I like about the substitute flash below is that you can use bounce flash for more flattering lighting. 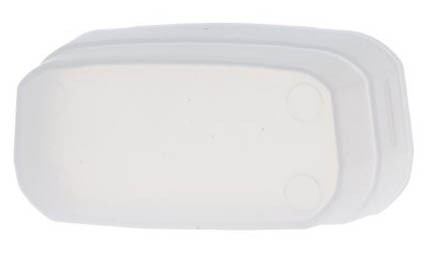 The foot is completely retractable so this small flash is even easier to store in a small place. How about combining your flash with a smaller camera? When I am shooting portraits for a client, I stay with my full-sized sensor in my 5D Mark III. Being an equipment geek I like to experiment with different camera-accessory combinations. You can use it on any sized camera that has a hotshoe. When I am looking for superior quality and want to keep my load light, I combine my 70D and a 270EX. That gives me a high performance APS-C sensor and flash that is so much more capable than the pop-flash that comes with the 70D. 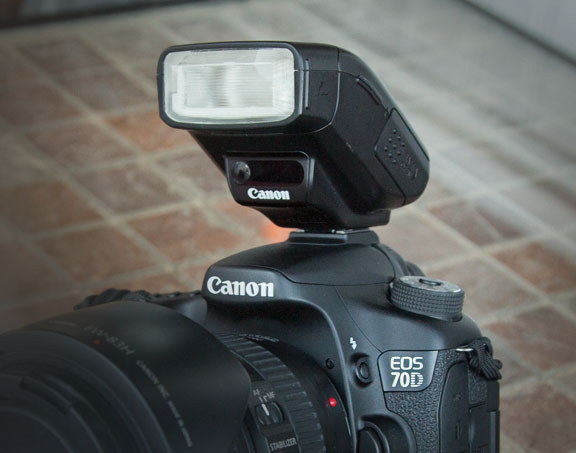 I can stow the flash in any available pocket and I can wear the 70D around my neck. I truly hope you get some useful insights from reading my thoughts and reviews on Canon camera equipment and make it your mission to enjoy yourself as you explore the possibilities of digital photography. Shoot with passion. More thoughts on the 270EX II accessories that make flash photography lighting so much better. You can use your Speedlite II to get High Speed Sync with your 270EX II. Alternatives instead of the 270EX II. There are other options available that can save you money with some compromise involved.